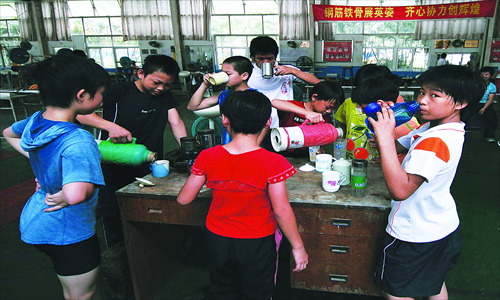 Have you ever wondered how the Chinese coaches train so many young children to become the future athletes? Does sacrifices mean everything to young children to endure pain and tortu during their strict training sessions in order to achieve successful world's records and gold medals for the country? Do these young children really dream and participate voluntarily to become top athletes? As the 2012 Olympic Games begin, we ask: What does China sacrifice in its relentless pursuit of gold? China is home to some of the world's best athletes. At the Beijing Olympics, the country topped the medals table, winning 100 medals in 25 sports, including 51 golds. And they are widely expected to do well at the 2012 London Games. Each year, young talent - some just five years old - are singled out by scouts and placed in special state-run academies where they are groomed to become future champions. Some, like basketball star Yao Ming, eventually achieve success. Others are not so fortunate. Zhang Shangwu, a former gold medalist at the World University Games survives by begging on the streets of Beijing. Zhang once had a promising career as a gymnast but was forced to retire a decade ago because of an injury to his achilles tendon. With his Olympic dreams dashed, Zhang attempted to study and find alternative employment, only to be rebuffed time and again because of his lack of paper qualifications. The young man turned to petty theft, spent time in prison, and is today homeless and penniless. Zhang is not alone. Retired Chinese athletes regularly complain that they suffer from injuries and unemployment, as the government frequently neglects their scholastic education and ignores their injuries while taking a sizable cut of their earnings in the name of national pride. Some athletes also say they faced abuse, exploitation and official interference during the course of their careers. But now, there are calls for change. Yao Ming himself is trying to reshape basketball in his country. In 2009, he bought his old team, the Shanghai Sharks, and hired coaches from the NBA to help revamp its training programme. Sang Lan, a former gymnast, is also a vocal advocate for change. Paralysed from the chest down following a tragic accident just before the 1998 Goodwill Games, Sang has been calling for better insurance coverage for Chinese athletes. In 2009, she wrote an open letter to Premier Wen Jiabao, urging him to look into the matter. Shen Jian, one of the country's leading BMX riders, recently refused to wear government-endorsed brands at the X Games Asia in Shanghai. Doing so, would have ended Shen's exclusive endorsement deal with his own sponsor. Shen was subsequently banned from competition. But he refused to back down and even formed his own company, which now oversees his career, and the careers of a small group of BMX riders. As the London 2012 Olympics unfold, it is clear that China's state-backed sports system is slowly being overhauled. But change might come too late for some athletes. What does China sacrifice in its relentless pursuit of gold? While most children enjoy their holidays by attending summer camps or throwing themselves into their hobbies, some boys and girls are sweating out in sports schools, practising to one day reach their Olympic dreams. 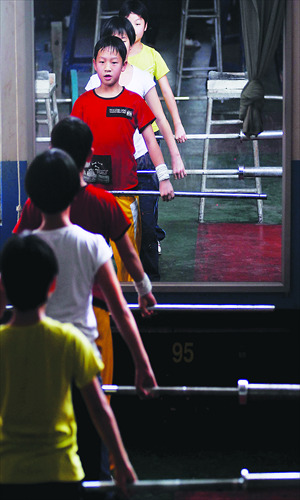 In a bungalow of the Xiamen Competitive Sports Management Center, Fujian Province, dozens of junior weightlifters are busy training under the watchful gaze of their coaches. Gao Xisong, 13, has been exercising harder in recent days. Weighing only 32 kilograms, she can hoist up iron plates weighing 37 kilograms. Her dream to be a top weightlifter has become firmer than ever since a former student of the same school, Lin Qingfeng, won the gold medal in the men's 69 kg weightlifting category at the London Olympic Games on July 31. Lin, 23, started when he was 10, had trained at the center for four years, before being selected for the provincial team in 2003 and then for the national squad in 2010. The whole center, especially its close to 70 weightlifting trainees, was excited at the news. China has become a steady competitor in worldwide weightlifting events. At the ongoing London Games, China's team of 10 weightlifters has reaped five gold and two silver medals. However, a mere handful can fulfill their dreams. All the trainees first try to make the national weightlifting team, which is made up of fewer than 100 athletes. Cao Xinmin, a weightlifting coach in Jiangsu Province, said that around 20,000 prospective weightlifters are training nationwide. However, Pan Qingyuan, deputy director of the center, told the Global Times on Monday that the number must be much bigger, since Fujian has 2,000 weightlifting trainees alone. Pan admitted that most kids sent to weightlifting schools come from poor families. "But as livelihoods improve, fewer parents want to send their children off to become weightlifters," he said. "After all, unlike most other sports, weightlifting requires more hardship, is less interesting, and offers fewer job options after retirement."